Who doesn't need more organization? della Q is known for their items. This is a simple, well constructed bag with a quirky statement. 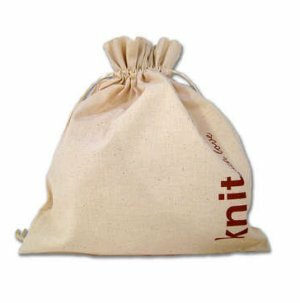 I was able to fit four yarn balls, needles and some basic notions in this bag. Great item to give or keep for yourself. Great for popping some yarn and needles/hooks into. I'm happy. You read my mind on this one. It is perfect for a scarf or other small project. I keep 1 or 2 bagged & ready to go for riding in the car or waiting rooms. I'm surprised how much they help pass wasted time. Sturdy fabric, well-made. Cheaper than Therapy has been my yarn-stashing motto for decades!!! I'll probably replace the ribbon with a sturdier drawstring at some point, but it's a fun bag. I love my Paws Off - Red bag. It's small and terrific for carrying around a crochet project or small knitting project (although the knitting needles might stick out a bit). There's even a pocket in there for your keys or mobile phone. I've purchased several of these bags and really like them. The measurements are listed in the description, so there is no excuse for "Oh, No, they're too small". .I usually give the bags along with the gift project I've knitted. Mine have all been of the finest quality!